The media is back to villainize another strike—this time of BART workers. When teachers in Chicago went on strike last year, their demands sounded very reasonable. After just nine days on strike, CTU fought for and won a contract that included hiring more than 600 additional teachers in art, music and physical education, making textbooks available on the first day of school and bringing in the percentage of teacher evaluations that are decided by standardized test scores down to the legal minimum of 30 percent. Yet the media presented both CTU and union president Karen Lewis as shrill, unreasonable, greedy forces more interested in razing the earth than rationally negotiating. The spin that the strike was really about greedy teachers hellbent on hurting kids quickly infiltrated the media’s vernacular. The same thing is happening now as workers for Bay Area Rapid Transit (BART) strike while negotiating for a new contract. This is BART’s first strike in sixteen years. Workers are asking for a wage increase (they haven’t received one in five years) and improved safety measures (bullet-proof glass in station booths, better lighting in tunnels, etc.). The union is asking for a 23 percent raise over four years, and BART countered with an offer of an 8 percent raise over four years, but the union says this offer falls below cost of living increases. A BART spokesperson called the safety issues a “smoke screen” even though BART police have reported more than 2,400 serious crimes at just five stations in the last three years—crimes serious enough to require reporting to the FBI. The union is also upset about a proposal for workers to pay more into their healthcare benefits. 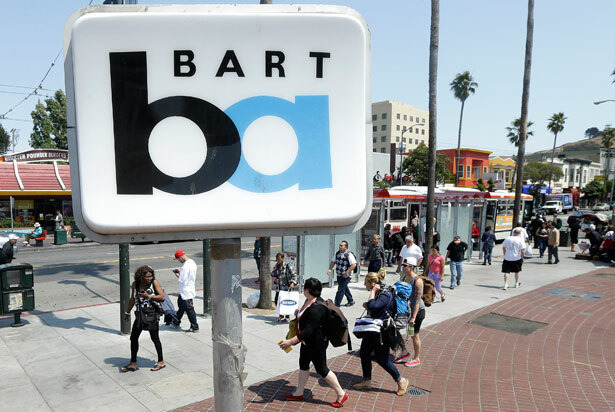 Dr. Steven Pitts, a union expert at the UC-Berkeley Labor Relations Center, says that rising healthcare and retirement costs have affected everyone in the Bay Area, but BART is unusual in that it had a revenue surplus this year. Since BART employees endured wage stagnation during the recession, they expect more now. “The unions have the capacity that says we helped you out in the past, and now we need you to pay us back,” Pitts said. BART does not have a “deficit,” as the Board says. BART faces a massive budget surplus of more than $1.2 billion over the next 10 years. And we don’t make half what they say we make. I’ve worked for BART for 22 years. My salary is $63,000 a year. If I were to retire today, I would get a pension of $2,100 a month—and we don’t get Social Security, just our pensions. BART workers haven’t had a raise in 4 years, since BART imposed a hiring freeze in 2009. We also face a mounting wave of violence on the job. BART police have reported more than 2,400 serious crimes at just five stations in the last three years—crimes serious enough to require reporting to the FBI. Yet BART refuses to even discuss the issue of safety for workers and riders in negotiations. All we want is a fair wage and a safe workplace. We don’t think that’s too much to ask. Please tell the BART of Directors to sit down and work out a contract that’s fair, equitable and honest, and gets this great system up and running. For perspective on salaries, consider a family of four living in the Bay Area needs roughly $74,341 a year to get by compared to $62,517 in 2008. BART officials have released inflated salary figures of BART train operators and station agents, adding fuel to the greedy workers myth. The officials claim these workers make an average of $71,000 annually when in fact the San Francisco Examiner reports they make a maximum of $62,000 annually. That might seem like an easy thing to fact check by talking to real-life workers, but then that would require reporters not taking officials at their word—a response many mainstream outlets seem to have trouble adopting. The typical media consumer would have to do a lot of digging in order to find the union’s demands because the media is presenting the story as Greedy Workers Versus Hardworking Americans. In all of these instances, the striking workers are presented as a nefarious force fixated on disrupting other workers’ commute for… some reason. Probably greedy motives. Usually, these kinds of articles open with a profile of some poor unsuspecting sucker who can’t figure out how they’re going to get to and from work because of the evil BART employees. Wayne Phillips did everything but swim as he struggled to get to his tech job in this city’s Financial District on Monday morning. His usual smooth ride on a Bay Area Rapid Transit train was derailed by the system’s first strike in 16 years. So Phillips drove from the East Bay city of Concord to Oakland. He stood in a “quarter-mile-long” line for a ferry. Then he gave up and jumped on his own boat, a 30-foot Bayliner named Lovin’ Life. Oh no! Poor Wayne! The reader is left feeling angry at those terrible BART workers who are on strike for… some reason. Probably for more gold chalices. Eventually, the LA Times gets around to exploring the actual strike—something about a broken-down negotiation—without casting any blame or exploring the details. City of Oakland employees joined BART workers on the picket line Monday for a one-day protest. Union leaders rallied a crowd in front of city hall by saying they had made concessions during the recession and that they deserved better compensation now that the economy was improving. AC Transit—a massive bus network which services cities east of San Francisco—had earlier threatened to strike as well once their contract expired on Sunday. Since AC Transit’s trans-Bay service shouldered much of the burden left by the BART strike Monday, the additional strike could have been disastrous. (The agency’s union, Amalgamated Transit Union Local 192, announced Monday morning they would continue negotiating instead.) Workers for the East Bay Regional Park District say they are planning to walk out over the Fourth of July weekend, and, as the San Francisco Chronicle reported yesterday, three unions representing University of California employees are also planning protests this week. Now, either all of these workers are greedy demons, or they have valid grievances and striking is their only means of recourse. It’s one thing for commuters to be angry about the strike. After all, it’s a natural human impulse to lose the ability to empathize once one is inconvenienced, but when the media joins in on the mob mentality, it skews the story into an unfair depiction of striking workers as history’s greatest monsters. The impulse to villianize workers is another sign of a societal divide between those who run our buses and trains and teach our children and the people who believe organizing in the workplace and going on strike isn’t something for them. Movements like the BART strike shouldn’t make us question why workers would struggle for a living wage—they should make us wonder why this kind of organizing isn’t happening everywhere. Non-union, federally contracted workers are also striking today in Washington, DC. Will they succeed in pressuring President Obama into enforcing higher labor standards?